… Because there is a Great Brook! 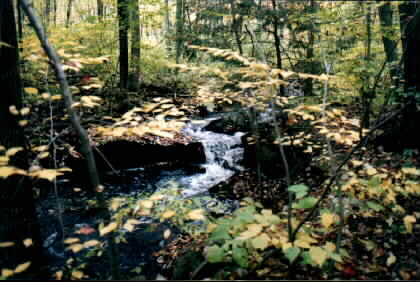 Early settlers in Bolton, Massachusetts harnessed Great Brook as a power resource to drive grist and saw mills, located a few hundred yards from Great Brook’s office. 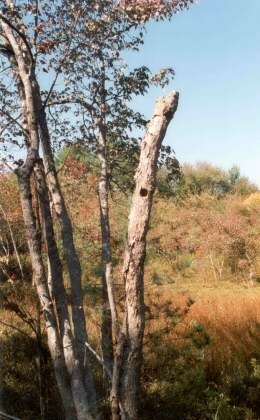 These are the remains of the saw mill. 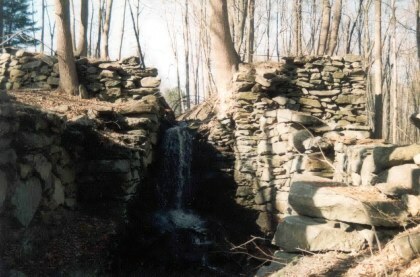 The gap in the stones is the spillway, and the drive wheel was situated in the foreground of the picture. Great Brook was also dammed — today, beavers do the damming! — to flood a cranberry bog just behind our office building. Before the beavers took over, on work breaks we’d harvest cranberries in the fall, getting feet a bit wet. Great Brook is housed in a converted barn built during the Jefferson (as in Thomas) administration, a building undoubtedly occupied by those who farmed the bog and worked the mills. 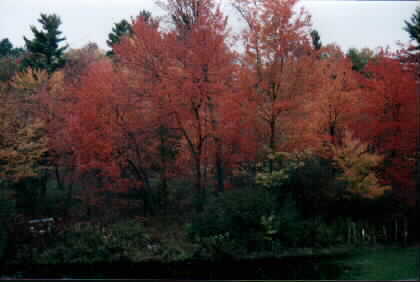 While Great Brook and the bog today provide beautiful views of sugar maples, especially in early October, we like to think that Great Brook’s purpose is to help companies harness the latent value in their support resources. The swamps may produce abundant mosquitos, but they’re much easier to tolerate when you see the beauty that the wetlands can also bring. 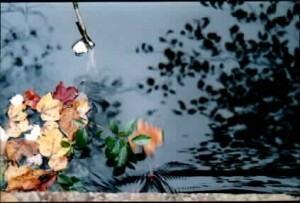 … and some fallen maple leaves floating on the water. 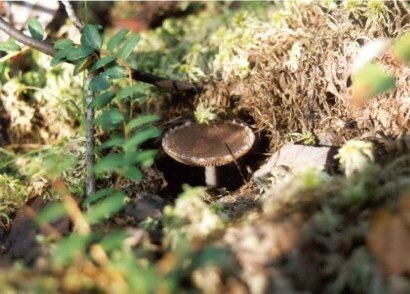 On the floor of the bog — in the dry summer — can be found interesting fungi. 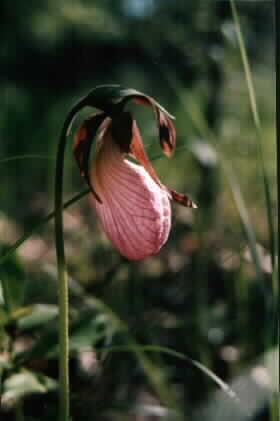 (This is the size of a nickel.) 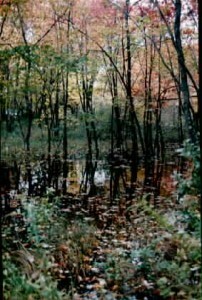 Unfortunately, the new beaver pond has obliterated much of this interesting bog life. 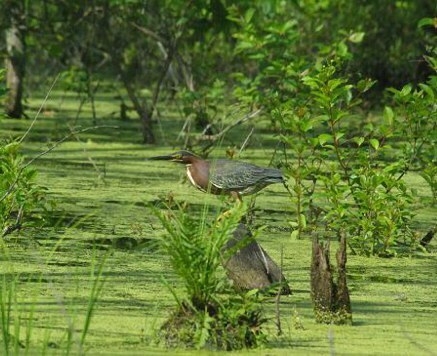 To the right is a green heron with his eye on a frog. Yes, he got him. 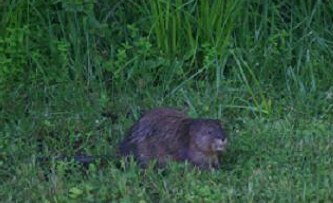 Below is one of our clan of muskrats. And sometimes pure chance provides an interesting view. Here a sugar maple displaying its beautiful crimson and yellow is helping out a fallen leaf from a pin oak. The still waters just before a culvert provide an interesting image of maple leaves amidst the reflection of the trees that spawned them. A bunch of berries is struggling from being the next object that rides the current towards the old mill sites. 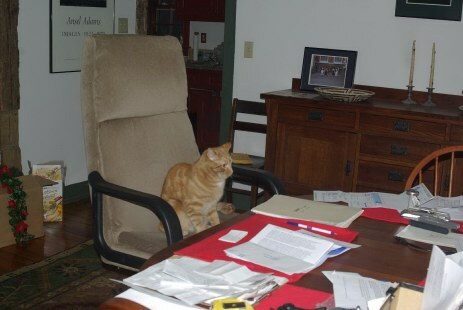 Alvin is our Accountant, here preparing our taxes. He’s as perplexed as we are when doing our taxes. 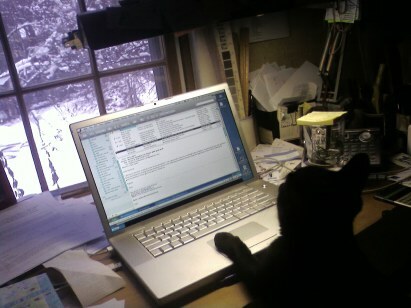 Simon is our Office Manager, here working on the morning email. Yes, he’s left pawed.